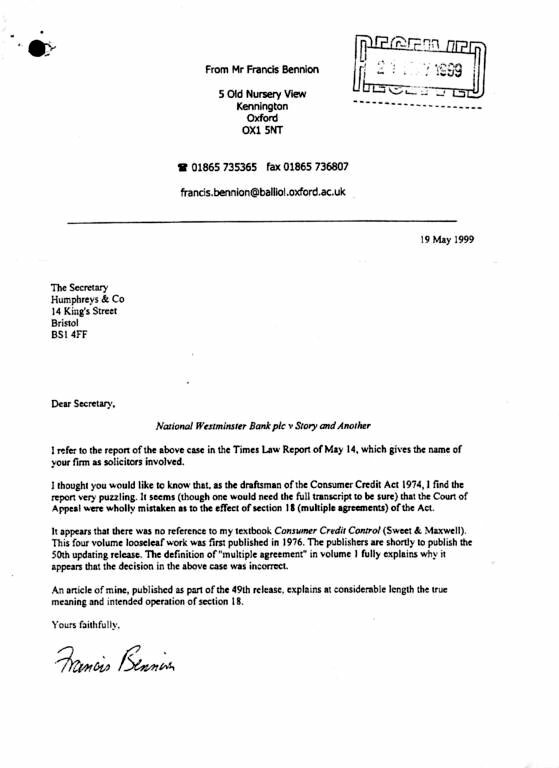 Referring to the "significance" of Auld LJ's finding that "the undoubted existing debt of about £12000" is within the limit of £15000 that qualified for regulation under Section 8 here, the Act's Draftsman, Mr Francis Bennion, has bravely spoken out against the ruling because Lord Justice Auld found that the contractual purpose of the new Multiple Agreement here was "partly to replace existing borrowings and partly to provide new monies". Where the existing borrowings are regulated, they are to remain regulated, however the credit trader may later "tinker" with the terms of those existing regulated agreements - eg Section 173 CCA forbids "contracting out" of the Act's formalities . Who better therefore,than Mr Bennion to clarify the intended effect of Section 18 (Multiple Agreements) to the new package of facilities that the Court otherwise allowed to successfully defeat the anti-avoidance mechanisms within Section 18 ? "........to the individual consumer faced with problems of the kind envisaged by protection legislation, it is little solace to know that the other party is a bank". Indeed in 1971, the banks were subjected to very few statutory controls, their status within society deeming to place them beyond reproach. Lord Crowther's white paper was similarly highly critical of the existing Common Law as it applied to moneylending; it tended to favour the powerful and it had become vague and subjective - and the outcome to a particular commonplace dispute would be decided upon the preferred choice of precedents before the Court. Lord Crowther recommended "a sweeping review" of the law, to correct the mischief in the Common Law with a standardised approach to common problems experienced by both Consumers and Creditors - the Act is not one-sided, its whole aim being to create a level lending field where transparency ruled the day; that "truth in lending" would prevail. The new legal framework was intended to make obsolete, to repeal, and did make obsolete, repealed, but for the decision here, the Common Law into Consumer Credit - where the new law is to apply - a point not lost on our Common Law Judges. The decision here effectively takes control for (consumer) moneylending cases away from Parliament. This is highly unsatisfactory, as Section 8 clearly demonstrates. Parliament decided that moneylending law was not an issue for the Common Law Courts - consequently, sole jurisdiction was granted to the County Court as a designated court of competence. Here, where the case was cleverly bundled up as a common law claim by the bank and placed before the High Court, Section 141(2) of the CCA deems the action as "improperly brought" where it was not transferred immediately to the County Court from the High Court, once it was clear to that Court that there was a CCA defence to the common law claim. Lord Crowther's report is a very interesting read indeed. It is highly recommended for anyone who wishes to study this important area of social law. Further applications to the Court(s) to reopen the case are in the pipeline. Please register your support (or otherwise) ! (email address below). Responses may well be posted.